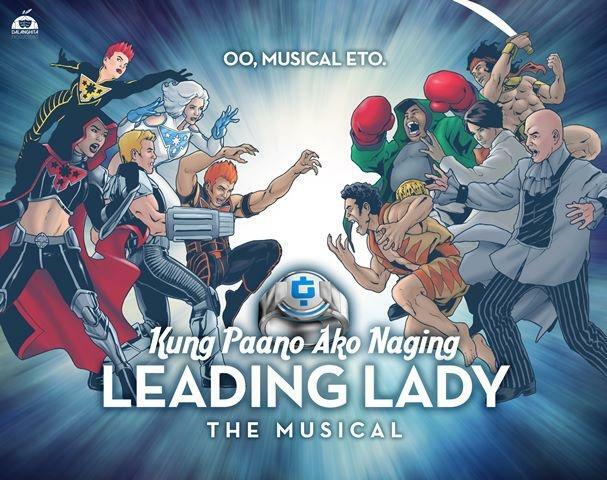 Manila’s newest theater group Dalanghita Productions, in cooperation with the Philippine Educational Theater Association (PETA), proudly presents KUNG PAANO AKO NAGING LEADING LADY THE MUSICAL from Carlo Vergara’s one-act play and graphic novel of the same title. Kung Paano Ako Naging Leading Lady revolves a story of two sisters named MELY and VIVA who both yearn to fulfill their dreams. Their sibling relationship and rivalry becomes more complicated due to an unsettled past and a budding romance, all in the context of an ongoing war between the superhero and supervillain teams. Being a maid is tough enough, but when Mely lands a job under a group of superheroes, she steps up to the unique challenge for the sake of her family. The musical takes us through the journey of the characters as each tries to find his/her place in the world where superheroes and supervillains exist. Kung Paano Ako Naging Leading Lady is bringing back the artistic team behind Zsazsa Zaturnnah ze Muzikal, which was a massive success with its multiple stage runs (the popular comic book and musical was adapted onto the big screen afterwards). The story of Carlo Vergara (creator of Zsazsa Zaturnnah), together with the music of Vincent de Jesus (Himala the Musical, Batang Rizal, Juan Tamad), will be brought to life by director Chris Martinez (I Do Bidoo Bidoo, Kimmy Dora, Temptation Island…Live!). The cast of Kung Paano Ako Naging Leading Lady boasts of the most talented and highly-respected artists coming from the theater, television and film industry. Topbilled to play the various roles are Menchu Lauchengco Yulo (Madre De Dios – leader of Puwersa Pilipinas), Bituin Escalante and Frenchie Dy (Mely – maid of Puwersa Pilipinas), Kim Molina and Natasha Cabrera (Viva – Mely’s younger sister), Markki Stroem and Hans Eckstein (Leading Man – newest member of Puwersa Pilipinas). 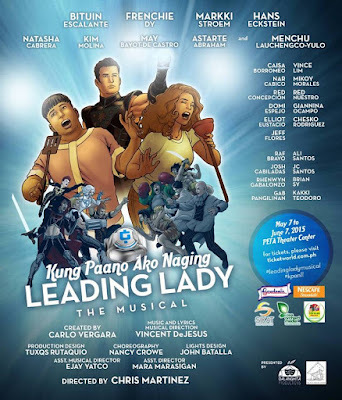 Lending support are the multi-faceted actors from Manila’s different theater companies namely include May Bayot (Nanay – Mely and Viva’s mother), Astarte Abraham (Madre De Dios - alternate), Giannina Ocampo (Nena Babushka), Caisa Borromeo (Windang Woman), Chesko Rodriguez (Popoy Pusakal), Jeff Flores (Bazooka Man), Nar Cabico and Domi Espejo (Senyor Blangko – leader of Kayumanggilas), Red Nuestro (Marakas Marko), Red Concepcion (Itak-Atak), Elliot Eustacio (Jeryc Sans Rival), Vince Lim (Henyotik), Mikoy Morales (Henyotik). The ensemble is composed of Kakki Teodoro, Raflesia Bravo, Gab Pangilinan, JC Santos, Brian Sy, Rhenwyn Gabalonzo, Alejandro Santos and Joshua Cabiladas. The artistic and creative teams of Kung Paano Ako Naging Leading Lady are as follows: Carlo Vergara (Creator and Writer), Vincent de Jesus (Musical Director and Composer), Chris Martinez (Director), Tuxqs Rutaquio (Production Designer), Lambert de Jesus (Technical Director), John Batalla (Lighting Designer), Nancy Crowe (Choreographer), Mara Marasigan (Assistant Director) and Ejay Yatco (Assistant Musical Director). The production team is composed of Ansis Aldrich Tan Sy, Pertee Briñas and Claudia Fernandez (Producers), Jerome Aytona (Stage Manager), Mariko Yasuda (Production Manager), Gee Pelaria (Assistant Stage Manager), RJ Deniega (Assistant Stage Manager), Toots Tolentino (Publicist), Kristin Bonifacio, Chuckie Campos Juan, Oskie King, Juan Lorenzo Marco, Guio Martinez, Phillippe Palmos, Celina Peñaflorida and Juan Miguel Severo (Sales and Marketing), Prodbook PH (Social Media Manager), Chester Ng (Photography). Kung Paano Ako Naging Leading Lady is set to open on May 7 and will run for four weekends until June 7, 2014. The show starts promptly at 8 p.m. (Thursday- Sunday). Matinee shows (Saturday-Sunday) start at 3 p.m.
All performances are at the PETA Theater Center located at No. 5 Eymard Drive, New Manila, Q.C. For bulk reservations, show buys, and inquiries, call or text at mobile number 0998-5311389 or send email to dalanghitaproductions@gmail.com. For tickets, please call Ticketworld at 891-9999 or via http://www.ticketworld.com.ph.